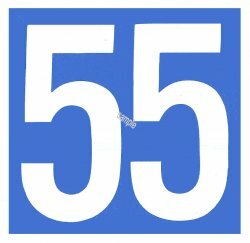 1956 Massachusetts 55 MPH Speed Limit sticker - $20.00 : Bob Hoyts Classic Inspection Stickers, Add a Final Touch to your Restoration! This awesome early 1960's Massachusetts sticker was found on the rear decks of all Massachusetts state police cars as well as Massachusetts state automobiles when the national speed law was passed setting the speed limit at 55 MPH. This sticker measures 3 1/4 inches square and has our patented "Peel and Stick" format to allow to attach it to your inside REAR center window.